This post is #10 in a series. You can read post #9 at Sebastian's blog, www.seabasscat.com. Isn't she adorable? You wouldn't know it by looking at her but she has two strikes against her. One, she's a black cat. Two, she currently has tummy issues. Ryker would have called them "magnificent barfisodes." And he would know. IBD is a chronic disease for which there is no cure, and no known cause. There are few things more frustrating to a pet owner than a chronically ill animal. And if this is known about the animal at the rescue shelter, well…that can certainly make the animal less adoptable. This was why Ryker's breeder was going to euthanize him, on the advice of her veterinarian. 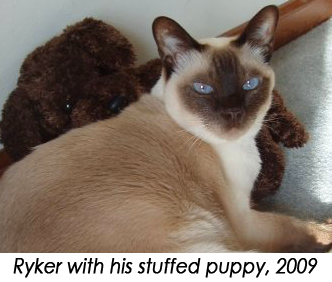 Ryker was a purebred Tonkinese, but he was also my rescue! The good news about chronic illnesses such as IBD is that they are manageable. In the case of IBD, it meant trying out various hypo-allergenic or limited ingredient diets, giving each one a full 2-week stint before moving on to our next candidate until we found one that worked. It meant managing flare-ups with medical therapy, such as corticosteroids (prednisone) and the occasional antibiotic. We did this only when needed, and the medication was fairly inexpensive. Ryker and I even got into a "pilling" rhythm (though he hated the antibiotic – nasty tasting stuff!). 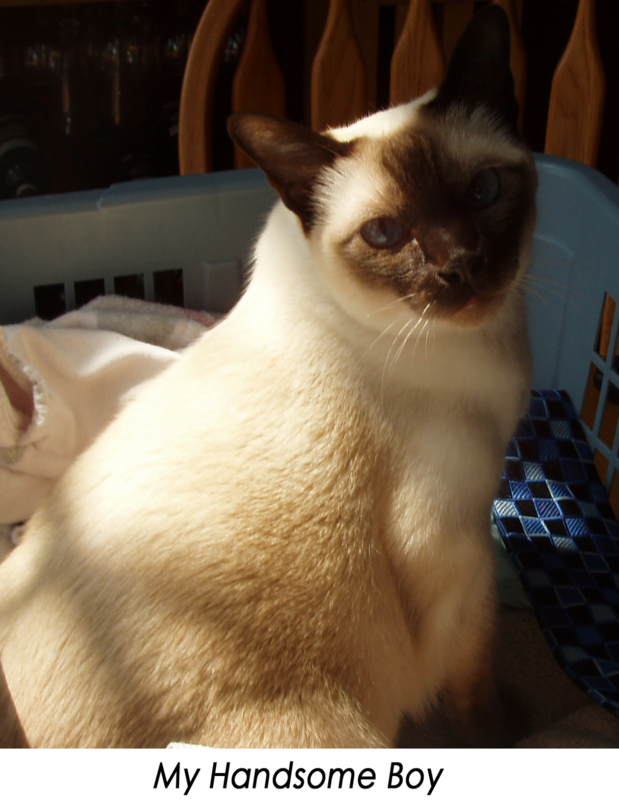 Cats with chronic disease aren't for every adopter. But they don't necessarily have to be the money pit or time-draining exercise that many may fear. Did we visit the vet more frequently than the average cat? Yes. But Ryker had pet insurance, and that helped out a lot. And my vet and I had those "flare-ups" down to a science: a quick once-over, a bottle of pills and we were out the door…often with only a minimal fee. And how often does it take to change a pillowcase or swipe up a mess with some carpet cleaner? I can tell you I'd give anything to have a few more years of that. Ryker's been gone ten months now, struck down suddenly – not by anything related to his chronic IBD, but of all things, a blood clot – and there's not a day that goes by that I don't miss him with all my heart. Licorice has not been diagnosed with IBD or any other chronic disease. She's just currently suffering from a bout of upset tummy. This adorable little girl is currently available at Wayside Waifs. We're glad Ryker had a good home with you. Our mom lost her first adoptee, Chumley, to a blood clot one night and doesn't want to remember that, wouldn't wish it on any other kitty. Purrs that Licorice finds a wonderful and loving forever home. We miss Ryker too sweetie. M is sending you a big HUG. This is an excellent post and a good reminder to take a chance on a less-adoptable pet. Mama's eyes are leaking. We're glad you gave Ryker a forever home despite his tummy troubles. He was a lucky kitty. BTW, Licorice gets Two Paws of Approval from Moi - that little girl has a set of LUNGS on her! MOL!! I still miss Ryker too. *sighs, thinking about dreamy blue eyes*.